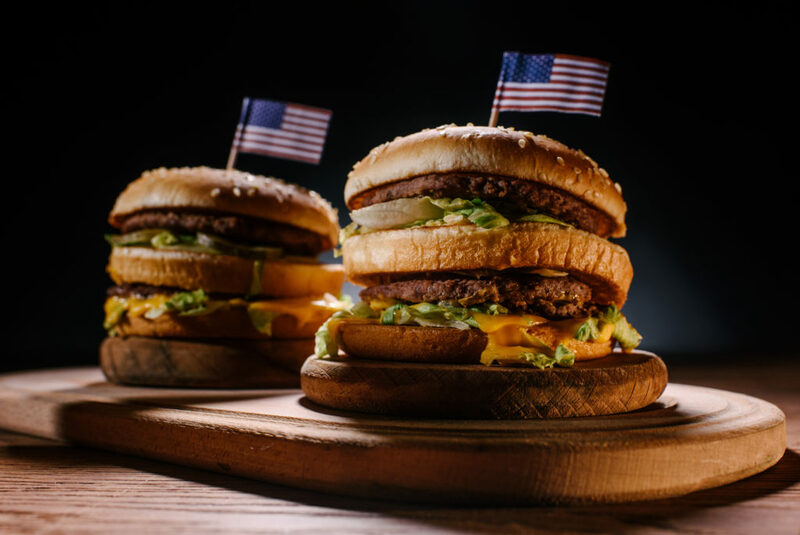 Named after the slang term for “nickel” which was the original price for a cheap burger during the war and depression eras, this burger is mixed with flour and soy meal and fried for a crunchy exterior and tender insides. The soy meals helped extend the meat longer during those tough times. You can still find these in choice spots in Northeastern Mississippi like the Slugburger Café. If you crave butter all the time, then you will love the butter burger originated at Solly’s Grille in Wisconsin. Butter is soaked into the buns and onto the patties themselves. If you ever find yourself in Salt Lake City, Utah, make sure you order a pastrami burger at one of the many Greek diners or restaurants around town. Burger innovators there have added thin sliced pastrami, cheese and Thousand Island dressing to perfect their burger. While some places on the East Coast, a California burger simply means a burger with lettuce, tomato and onion, which is pretty much standard burger toppings, but on the West Coast a California burger means a burger with guacamole/avocado. This vegetarian alternative is a lot heathier than the meat burgers but just as tasty. The sweet potato and avocados give the burgers just the right amount of texture and taste to make your mouth water. This is another meatless burger. The quinoa is really good for you but tasty too. You definitely won’t feel like you are missing out on anything. Sauces, Buns, & Toppings Oh My! Most restaurants have their own take on the American hamburger. From special sauces to different types of buns and toppings, they try to offer their customers something more than other burger restaurants. Take for instance, Zac’s Burgers. For the last 33 years, they have prided themselves on delicious made-to-order meals including their signature burger with their unique wacky zacky sauce and friendly service at a reasonable price. You Get Brand Power. By joining Zac’s Burgers, you will benefit from sharing in the brand recognition. Zac’s Burgers is a family-oriented business who is currently located in the Philadelphia area and is looking to expand. Zac’s is known for its quality food, top notch service and friendly atmosphere. They are known for treating their customers and staff like family. With Zac’s you also have the option of running a food truck which has become more popular in the last few years. They Support Veterans. Believing in the overall mission of the burger franchise program you are joining is very important. You are always going to work harder when you are passionate about what you are trying to achieve. At Zac’s, they are very passionate about supporting veterans. Not only do they hold community events to help raise money and support for veterans, they also offer veterans special franchise opportunities, particularly with their burger bus. Quality Food for Your Menu. When you license a brick and mortar burger franchise or a burger bus from Zac’s Burgers who has locations in Philadelphia and the Delaware Valley, you will always feel confident in the food you serve. For the last 33 years, they have prided themselves on delicious made-to-order meals and friendly service at a reasonable price. They Are Very Community-Oriented. Zac’s Burger is very involved in the communities they serve. Besides their support of local veterans, they also participate in other community events and also try to stay in touch with what is important to the people they serve. If this is important to you as well, then you will love becoming a part of the Zac’s Burger family. Food Trucks and Brick & Mortar. Another great thing that makes Zac’s an awesome burger franchise opportunity is that you have a choice between opening a brick & mortar franchise unit or licensing a burger bus. Food trucks have become really popular in the last few years and they tend to be a little more affordable to operate when you are just starting out so it is always nice to have options. They’ve Got Your Back. While all franchise programs offer you some sort of support structure to help you get started as a new burger franchisee, with Zac’s Burgers you know that they truly have got your back. They will make sure you have the support and tools you need to be successful, including advertising and marketing help, staff training and help with your grand opening. Whichever burger franchise you choose, make sure you look carefully at your finances, your expected return in investment, and also think carefully about whether your vision for your restaurant matches that of the parent company. The more prepared you are, the best chance you have of succeeding. Some of the pros are that you are given an already established product or service to sell allowing you to capitalize on the franchisor’s brand name recognition and that you are offered a support structure and training to help you get your franchise unit up and running. One of the cons is that you do not have complete creative control. You have to adhere to all the regulations agreed upon in the franchise agreement and you can’t just make whatever changes you want. Often times you will have to buy your supplies directly from the franchisor whether or not you think you can get a better deal somewhere else. Plus, there is the financial burden. Besides the initial franchise fee to get started, you will also have to pay royalties and advertising fees. If you are interested in learning more about joining Zac’s franchising program, call them today.